TIME FOR ACTION! - The COP decided at its 24th session that COP 25 will take place in Chile and requested the Bureau to decide on the dates of the sessions. STRAITS TIMES DECEMBER 5 2018 - Climate crusading schoolgirl Greta Thunberg pleads next generation's case. KATOWICE (AFP) - By the time 15-year-old Greta Thunberg is 45, tens of millions of people are expected to have fled their homes as climate change unleashes a maelstrom of extreme weather, crop failures and devastating forest fires. Although it is her parent's generation and those before who have made climate change possible, it is the billions of young people like her who will bear its brunt. And she has had enough. "It's us who are going to live in this world. If I live to be 100 I will be alive in 2103 and that is a long time in the future," she told AFP at the COP24 climate talks. "We will have to live with the mess that older generations have made. We will have to clean it up for them. That is not fair." Greta has become a leading name in the growing campaign from youth across the planet, pleading to lawmakers and corporations to slash greenhouse gas emissions and avert runaway global warming. Officials from nearly 200 nations are at a UN climate summit in Poland trying to agree on a rulebook that will make good on the pledges they made under the 2015 Paris agreement. That treaty aims to limit global temperature rises to well below 2 deg C and beneath the safer threshold of 1.5 deg C if at all possible. But with just 1 deg C of warming so far, Earth is already being buffeted by superstorms, droughts and flooding made worse by rising seas. And the World Bank has warned that if action is not taken by world governments, 143 million "climate migrants" will be displaced by 2050. Greta and her actor father Svante are at the COP24 talks in the Polish mining city of Katowice to call on lawmakers to act now for the good of future generations. And they want everyone else to do their bit. After learning about the impacts of people's carbon emissions, Greta insisted that her family become vegan and give up flying. "For me none of this is sacrifice, I don't need those things," she said. "I understand that some people see it as sacrifice. People don't want to stop flying but it's just something we have to do. There's no other option." 1. TRANSPORT: Phase out polluting vehicles. Governments aims to end the sale of new petrol, and diesel vehicles by 2040 but have no infrastructure plan to support such ambition. Marine transport can be carbon neutral. 2. RENEWABLES: Renewable energy should replace carbon-based fuels (coal, oil and gas) in our electricity, heating and transport. 3. HOUSING: On site micro or macro generation is the best option, starting with new build homes. 4. AGRICULTURE: We need trees to absorb carbon emissions from a growing population, flying, and to build new homes. Reducing food waste and promoting less energy intensive eating habits such as no meat Mondays. 5. INDUSTRY: Factories should be aiming for solar heating and onsite renewable energy generation. 6. POLITICS: - National governing bodies need to adopt rules to eliminate administrative wastages, to include scaling down spending on war machines, educating the public and supporting sustainable social policies that mesh with other cultures. 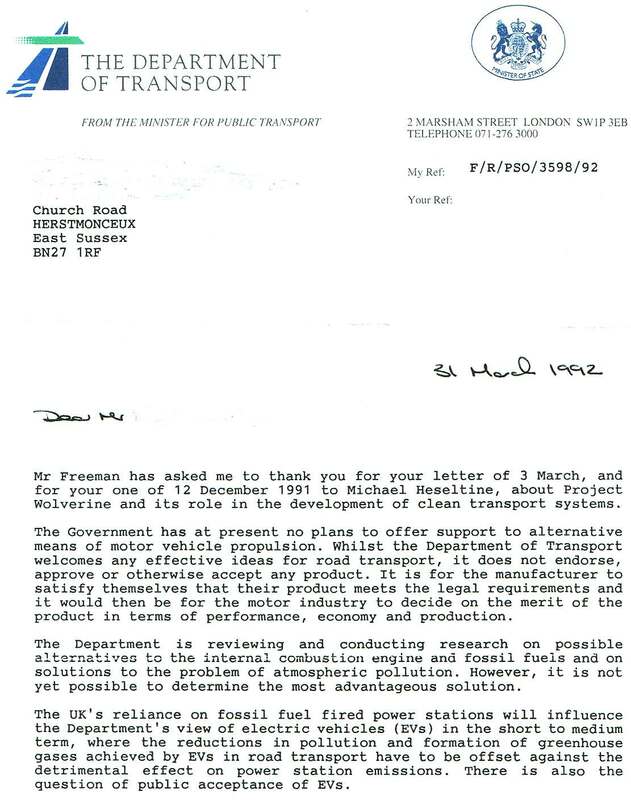 NEGATIVE EVIDENCE - The UK Government have known about potential solutions for years, but steadfastly found reasons to refuse funding in favour of sustaining use of the internal combustion engine. 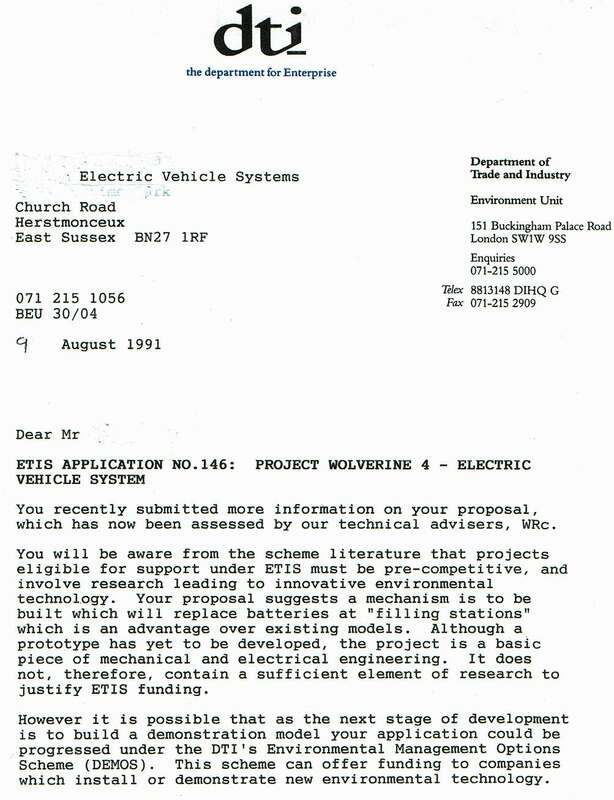 A DEMOS application was equally time wasting for the engineers, who in the end gave up, but not until 1996 when a SMART AWARD application was also refused, in this case perhaps not so smart on the part of the policy makers. In 2020 there are renewed calls on this topic. Unfortunately, the engineers concerned are now concentrating on solar and wind energy for ocean transport. The lesson is clear, support your champions as that step up the the podium. Do not let businesses with existing technology to protect get into the chain to put the brakes on. That ruled out auto makers of course. It is staggering that with cartridge exchange technology allowing recharging of EVs in less than a minute in 1996, and with a low cost service station design for load leveling on the drawing board, that the technology was passed over. In our view what that really means is that the Governments were not that bothered. Maybe it suited them to pursue dead ends to keep IC vehicles going for their influential political supporters. Who knows. For sure the level of apathy has sparked mass protests again in 2019. 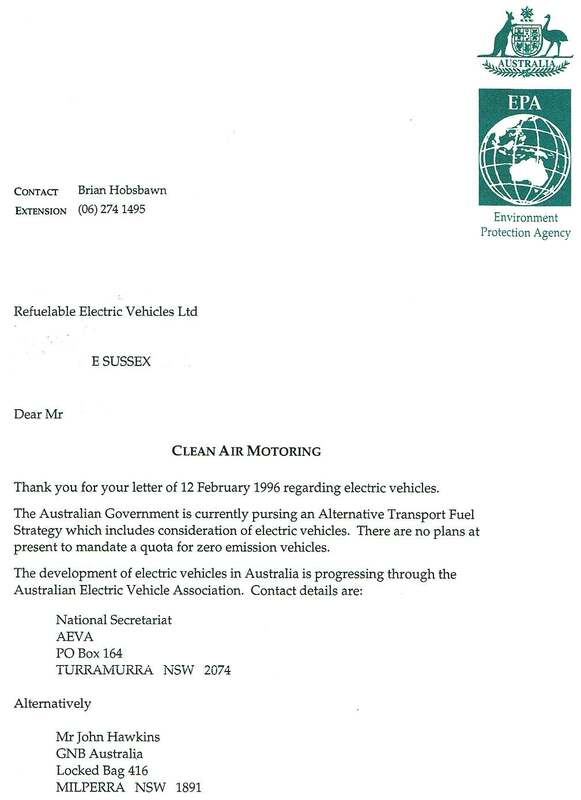 COMMONWEALTH - The same policies were being pursued all over the globe by Commonwealth countries that appeared to be either taking their steer from the UK or maybe it was just a general G20 agenda - for sure they were against batteries in electric cars - but history shows us that this was the way to go, now with battery electrics being prevalent, having ousted hydrogen and fuel cells that was at the time the favoured technology. That does not mean fuel cells and hydrogen might not one day make a come back. It just means that the energy efficiency cycle of battery EVs is better at this time. 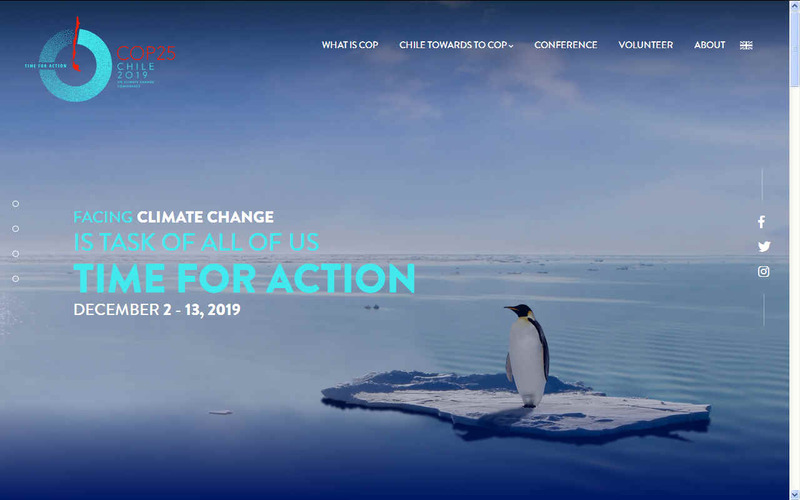 The next summit was expected to take place between November 11 and 22, 2019, but Chilean President Sebastian Piñera now says COP25 is more likely to be held in January 2020. The Cerrillos Bicentennial Park has approximately 30 gross hectares + 10 net hectares for a capacity of 25,000 people. This site is the former international airport of Santiago and has tremendous potential: Excellent connectivity, location and size to have a World Class Event Center. The Venue of COP25 will guide visitors to the heart of the summit, taking the official delegates to the Blue Zone and the rest of the public to the Green Zone. 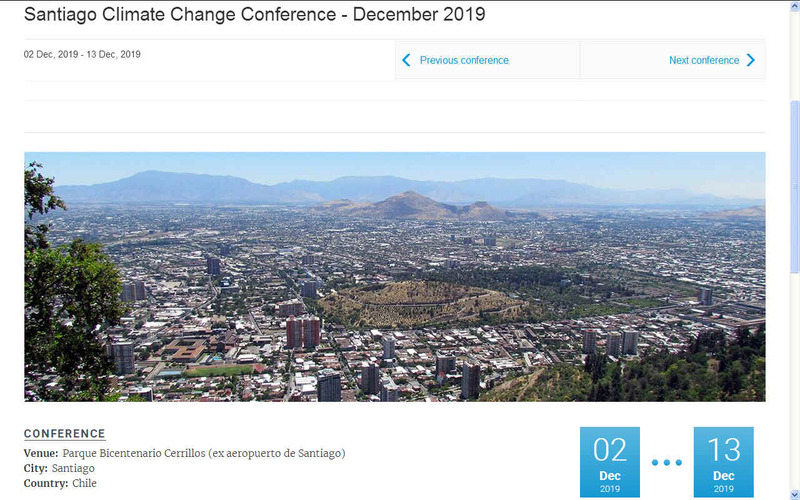 In this last sector, Chileans will participate in this unique citizen event thanks to the public-private partnership, to show the country's innovation and commitment to climate change. The Santiago Arturo Merino Benitez / Nuevo Pudahuel International Airport is 20 minutes from downtown capital. The RED, The Metropolitan Mobility Network, the public transportation system of Santiago, integrates fares to the buses, the Metro and the MetroTren Nos, facilitating the trips of the attendees. These three modes are paid through a single means of payment: the card beep! Foreigners who wish to visit Chile, must obtain a tourist visa for recreation or similar purposes. This visa is granted to foreigners who intend to travel to Chile for a specific period for recreation or similar purposes. The nationals of the countries with which Chile maintains a Tourist Visa Exemption Agreement are exempted. Check if your country requires a Tourism Visa (VISTUR) in the Visa and Tariff Schedule (In the process of being updated). Foreigners who enter the country for recreational, sports, health, studies, business, family, religious or other similar purposes, without immigration purpose, permanent residence or the development of remunerated activities will be considered tourists. What do I need to do the procedure? Present a passport issued by the corresponding authority of the country of origin, valid for longer than the visa application deadline. Four passport-size photographs without a caption or RUT Proof of economic solvency during your stay in Chile Letter of invitation from a natural person or a company in Chile Hotel reservations when you do not have a contact person in Chile. • Compliance with these requirements does not compromise the granting of the visa. • During the processing of the visa application may require the presentation of additional background. The maximum term is 90 days, however, it will depend on the country. For more details, see the maximum. To enter Chile, tourists must check in at International Police by presenting their identification documents (either identity card or passport) and stamped visa (depending on the country of origin). – Tourists from Argentina, Brazil, Bolivia, Colombia, Ecuador, Uruguay, Paraguay and Peru can enter with their ID cards or equivalent documents. – The International Police Office provides a duplicate form called "Tourism Card" when entering Chile. This card is personal and non-transferable and its duration is 90 days, extendable for another 90 days. The copy must remain in the tourist's possession for the duration of their stay in the country and must be presented to the International Police upon leaving Chile. The extension of validity of the Tourism Card is requested in the Immigration Office of the government closest to your place of stay and if you are in the city of Santiago, the Office of Public Assistance of this Department, located on Matucana Street 1223, Santiago. – To enter Chile as a tourist, you must prove economic solvency. 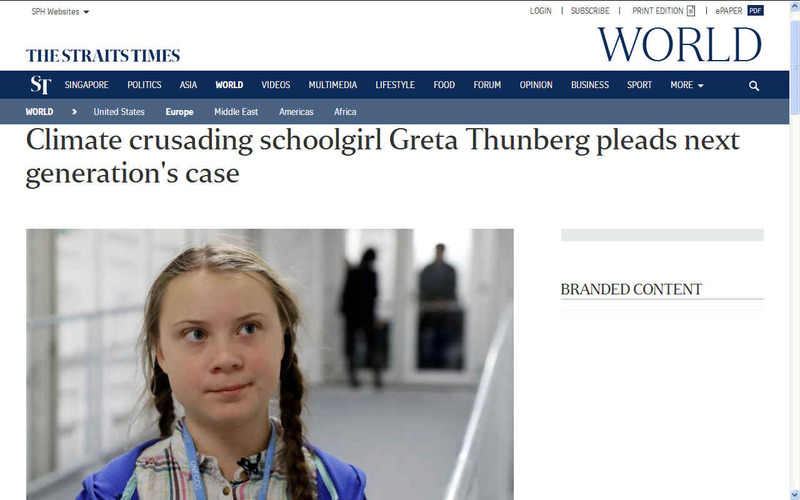 GRETA THUNBERG - is a Swedish climate activist. At the COP24 climate talks in Poland, Decembel 2018, Miss Thunberg addressed the Secretary-General of the United Nations. She received a standing ovation for one of her talks. She is behind the global school strike created to call attention to climate change. She is a rebel. With a cause. Thunberg is 15 and autistic and the newest, youngest and most powerful voice on the world stage demanding the world address global warming. Go Greta! WILL THERE HAVE BEEN ANY REAL AND MEASURABLE PROGRESS IN 2019 ? That is the burning question. We owe it to our children to put the brakes on the uncontrolled use of fossil fuels. All over the world schools are experiencing strike action in protest at the inaction of the United Nations members to get their act together. We need to turn the ship and we have a very small rudder. When the captain of the Titanic spotted the iceberg that sank the White Star Line's most famous ship, he tried to avoid the giant floating ice cube by putting the rudder hard over and reversing the propellers, but the ship could not turn in time to avoid a collision. Where Greta Thunberg sent the United Nations a clear message in December 2018, how much progress will have been made by the Parties. Wil we have a bigger rudder than the Titanic, or will planet earth crash and burn. Since the inception of the COP talks, there has been very little action and a lot of hot air. All the while we have playground bullies like Donald Trump and Vladimir Putin, the world is in danger. Russia and the USA need to grow up and stop beating up the countries that cannot afford to defend themselves. Climate Criminals like these two super powers need to look long and hard at China, where they use coal for energy, but have agreed to a call to action and are building solar and wind farms like there is no tomorrow. WHAT IS COP ? - The United Nations Framework Convention (UNFCCC) is the international response to climate change. . It is a treaty that establishes the basic obligations of the 196 Parties (States) plus the European Union to combat climate change. It was signed at the Earth Summit in 1992 and came into force in 1994. Chile joined that year. The Conference of the Parties (COP) is the supreme decision-making body of the Convention. The Parties meet annually to review progress in the implementation of the Convention where other instruments that support the implementation of the Convention are proposed, evaluated and approved. The first COP was held in Berlin in 1995. To date, 24 COPs have been held, the last one in Katowice, Poland, in December 2018. The COP Presidency is rotating in the following 5 regions of the United Nations: Africa, Asia, Central and Eastern Europe, Western Europe and Latin America and the Caribbean. Now it's Chile's turn. Chile is responsible for only 0.25% of global emissions, however, our country is very vulnerable to climate change. We comply with 7 of the 9 conditions of vulnerability, which places us among the ten countries most affected by this phenomenon, according to the report of the Global Climate Risk Index 2017, presented by Germanwatch at COP22. 7. To be a country whose economy depends to a great extent on the income generated by the production, processing and export of fossil fuels and associated products of intensive energy, or their consumption. The only two criterias that Chile doesn’t have are: being an island or a landlocked country and countries of transit. On the other hand, we have 8 years of a great drought that has affected 70% of our population; serious forest fires consuming more than 500 thousand hectares and destroying 17% of our native forest; Shocking floods have devastated entire cities such as Chañaral; Hailstorms in summer have strongly impacted the production of fruits such as blueberries, cherries, kiwis and table grapes in the sixth and seventh regions. This reality does not admit double interpretation. Only a more determined climate action can change our destiny. Chile is a world reference for the seriousness and responsibility with which it assumes the commitments acquired. In the last COP24, we delivered our 3rd Biennial Update Report on Climate Change that contains all our emissions inventory from 1990 to 2016. We were the first developing country to deliver this report and also to do so in the corresponding year (2018). The presentation of this Report will allow not only to evaluate the effectiveness of the measures taken, but also is a fundamental pillar to define future climate change policies. This report is a clear and forceful reflection of Chile's commitment in terms of transparency and management of its emissions to move towards emissions neutrality, key to sustainable development. 1) In 2016, the balance of the Forestry sector captured 65 million tCO2eq, increasing its sink status (GHG collector) by 30.8% since 1990, but decreasing it by 8.9% since 2013 (mainly due to fires forestry). 2) Countries belonging to the OECD have an average of 9.2 tons of CO2 per person, while the global average of CO2 emissions per person is 4.4 tons. We see that the greater the development, the greater the GHG emissions. Our country surpasses that figure by very little, with 4.7 tons of CO2 per person. Therefore, we must strive to decouple, on the one hand, development, and on the other, the emission of greenhouse gases. That is our goal. 3) Regarding the intensity indicators of greenhouse gas emissions by gross domestic product, this was 0.93 tons of CO2 equivalent, decreasing by 10% since 2007. The reduction of Chile's emissions indicator shows that the country has been able to generate growth without necessarily increasing its emissions equally. This reinforces the conviction of the government of President Piñera, that there is no real development, if this is not sustainable. Between 2014 and 2018 we doubled the generation with renewable energies from 10% to 20%, fulfilling in advance the goal of generation with unconventional energies from 20% to 2025. The goal to the year 2050 is to have 70% of clean generation. Chile firmly believes that the scientific approach is key to further progress and that accurate and transparent data is essential to achieve effective climate action. The UNFCCC secretariat is located at two different locations. 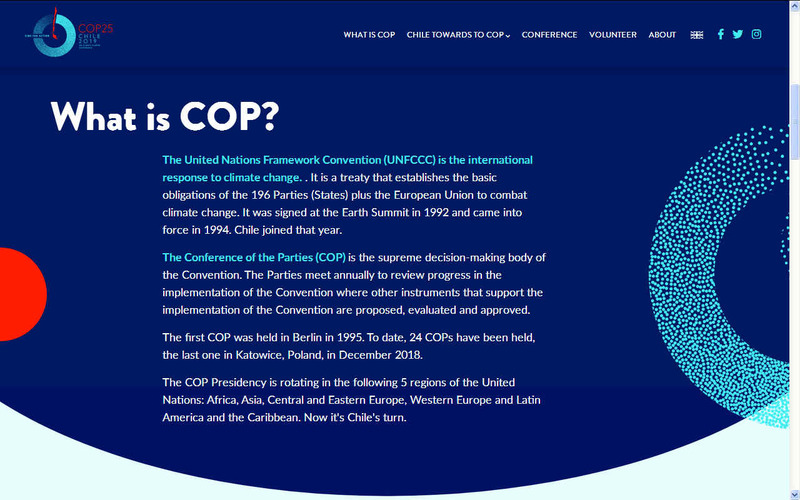 COP THAT - The United Nations Climate Change Conferences are yearly conferences held in the framework of the United Nations Framework Convention on Climate Change (UNFCCC). They serve as the formal meeting of the UNFCCC Parties (Conference of the Parties, COP) to assess progress in dealing with climate change, and beginning in the mid-1990s, to negotiate the Kyoto Protocol to establish legally binding obligations for developed countries to reduce their greenhouse gas emissions. From 2005 the Conferences have also served as the "Conference of the Parties Serving as the Meeting of Parties to the Kyoto Protocol" (CMP); also parties to the Convention that are not parties to the Protocol can participate in Protocol-related meetings as observers. 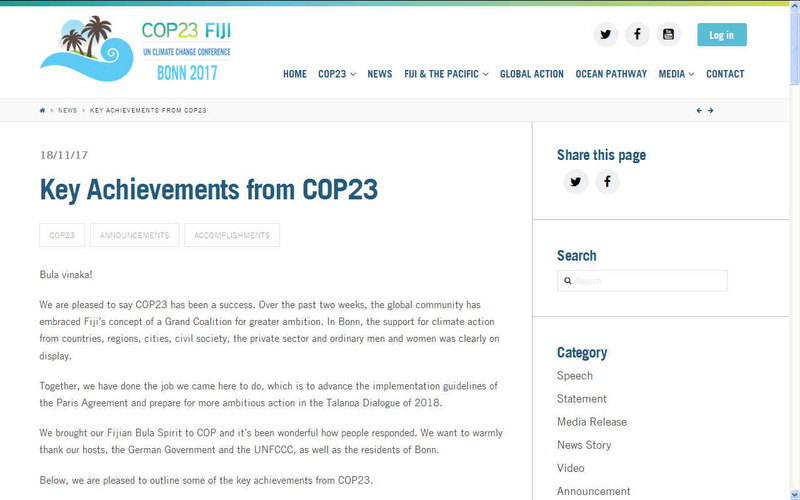 From 2011 the meetings have also been used to negotiate the Paris Agreement as part of the Durban platform activities until its conclusion in 2015, which created a general path towards climate action. The first UN Climate Change Conference was held in 1995 in Berlin. This website is provided on a free basis as a public information service. copyright © Cleaner Oceans Foundation Ltd (COFL) (Company No: 4674774) 2019. Solar Studios, BN271RF, United Kingdom. COFL is a charity without share capital. The names AmphiMax™, RiverVax™ and SeaVax™ are trade names used under license by COF in connection with their 'Feed The World' ocean cleaning sustainability campaign.